BOC Senior Citizen’s Account-A Confident Approach towards the Golden Years of Life. With the confidence that was built over 80 years as the trusted Banking Partner for Sri Lankans, the Bank of Ceylon was able to assist people of all walks of life with products and services that are tailor made to cater each segment. Encompassing the financial care our seniors deserve, Bank of Ceylon’s Senior Citizen’s account ensures to boost the confidence through multiple benefits embedded within the account. Currently BOC Senor Citizen’s savings account, offers higher interest rate that of the normal savings account along with a free debit card. This account too can be powered up as a “SmartGen” account and enjoy free Debit card and free digital banking facilities such as free online banking registration. Adding more convenience with the digital technology BOC’s easy to use 24 hour enabled “B-APP” mobile banking facility allows the comfort of banking anywhere at any time to maintain serenity in the golden age. Regular account maintenance such as own account fund transfers, third party BOC account transfers, other bank fund transfers, balance inquiries, payments at POS machines, quick updates on stipulated accounts via SMS alerts, utility bills and Credit Card bill payments can be done at the convenience of “click” of a button. The account holder or in the case of joint account- account holders should be above the age of 55 years however he/ they can nominate any person below the age of 55 by filing a special nomination form. 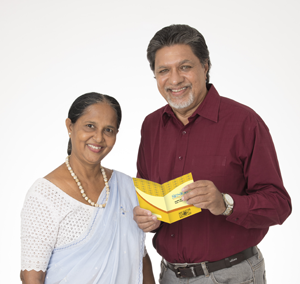 Taking a part in the Government initiative to encourage and build confidence within senior citizens in the country, Bank of Ceylon opened up a special interest scheme applicable for a Fixed Deposit of a Senior Citizen. Only an amount up to Rs. 1.5 Million will be entitled for this special interest rate fixed deposit and withholding tax will be exempted for these. BOC offers another exclusive opportunity to Senior citizens to build a stronger retirement with a loan facility up to a maximum of Rs. 1.5 Million that has a repayment period up to Ten years subject to special conditions. Senior citizens who are between ages of 55 years and 67 years can apply under this loan scheme and the loan amount will be decided on the monthly loan installment being within the 40% of gross pension. The loan amount will be scheduled to be recovered in full three months prior the applicant reaching the age of 70 years. (Conditions apply). Leading the Sri Lankan Banking industry with over 79 years experience, the Bank of Ceylon has become the most stable and the trusted bank in the country that serves Sri Lankans from all walks of life helping them to build their lives and making themselves financially stable whilst uplifting the country’s economy. The Bank earned global recognition as one of the top 1000 banks in the world, as listed by “The Banker Magazine” (UK) and the “The Asian Banker” magazine named the Bank of Ceylon as the Strongest Bank in the country for the year 2018. “BOC” was awarded the “Peoples Service Brand of the Year” at the SLIM – Nielsens Peoples Awards 2018, which reflects the brand strength among general public. The Bank claimed its award as the only Sri Lankan brand recognized as one of Asia’s Best Brands in 2013 by the Chief Marketing Officer’s Asia Council (CMO Asia Council) based in Mumbai, India. Brand Finance Lanka in partnership with media services (Pvt) Ltd has ranked Bank of Ceylon as the country’s No. 1 brand and No.1 Bank for the last ten consecutive years in their “Brands Annual” publication and it was also conferred the Master Brand status for the year 2017- 2018 by the CMO Council Asia. InterBrand too conferred “BOC” as the No.1 Brand in the country at their very first convention held in Sri Lanka. The Bank has passed exceptional milestones in recent years such as becoming the first to gain Rs. 2 Trillion assets, over Rs. One Trillion Deposits and over Rs. One Trillion loans and advances that strengthens the Bank’s balance-sheet with a triplet of “Trillion” components. Focusing on the Banks achievement, Fitch Rating Lanka ranked the Bank of Ceylon at AA+(lka) which is the highest rating awarded to a local commercial bank and ICRA (lk) awarded AAA rating which is the highest credit quality rating issued by ICRA Lanka. The Bank of Ceylon currently owns 631 branches, 778 ATMs and 293 CDM/ CRM machines across the country digitally enabling every Sri Lankan within the country.